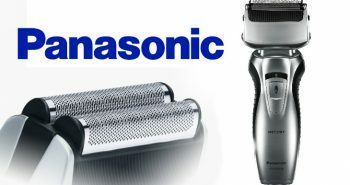 Many people think that the Philips Norelco line only has rotary-style shavers, but that’s not true. Philips wants to ensure that men can do all of their hair styling chores with the Philips Norelco All-in-One Styler & Shaver. 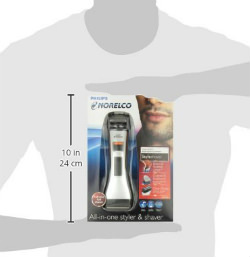 This is a men’s personal hair trimmer that can be used for both trimming and shaving. It has a notable foil-style head, and is not a rotary style like many of the other Philips Norelco products on the market today. The Philips Norelco All-in-One Styler & Shaver comes in a white plastic body, with a silver foil head encased in black plastic. There are some black and red lines down the side of the shaver to make it attractive. There is a square black and red push button on the bottom front of the appliance. 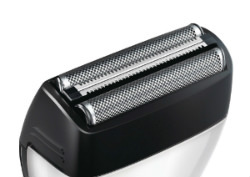 The styler and shaver is reversible, with a shaver on the top, and a hair styler on the bottom. It only takes a flick of your wrist to switch ends. There is a red styling comb included, which attaches to the bottom styler. 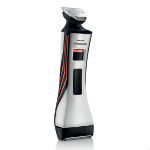 The shaver is used for shaving the face completely of hair, while the bottom styler is used to trim and leave hair, such as for leaving behind stubble, beards, goatee, moustache, or sideburns. Built within the foil style head on the top of the shaver are two foils and two metal lines of teeth. This is a triple action cutting system that will trim more hairs in one stroke, and is suitable for trimming even the toughest beards. 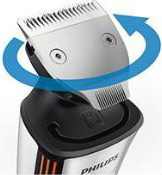 The integrated trimmer will shorten longer hairs, while the double foils will tackle the stubble. The styler comb also has twelve different settings. These are used to create your favoured length, whether you just want stubble, or you want to leave behind some long beard growth. 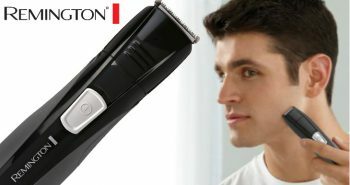 Now you can customize your length so that you don’t look like any other man who has also purchased the same Philips Norelco All-in-One Styler & Shaver. The red comb works on an adjustable wheel lock system that you access from the bottom of the trimmer. You only need the one attachment, and not several combs, like you’ll see on other shavers. You have the choice of 1/32 inch stubble to 13/32 beard, or 0.5 mm to 10 millimetres in metric. If you don’t wish to use the comb then you have a double sided metal trimmer with combs. One has a wide trimmer on one end, with a narrow detailer on the other side. 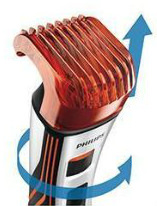 The Philips Norelco All-in-One Styler & Shaver is powered by a lithium ion battery which is included with your purchase. This is a rechargeable battery which will enable you to use the Philips Shaver and Trimmer without a cord, and not have to worry about replacing any batteries. There is a separate charging cord included. There is also a handy charging stand, so you can keep your shaver and styler neat and tidy on your bathroom counter. 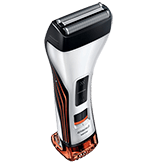 One full charge of your shaver will give you seventy-five minutes of running time, which is exceptional, considering that most cordless shavers can boast of a fifty minute shaving time. 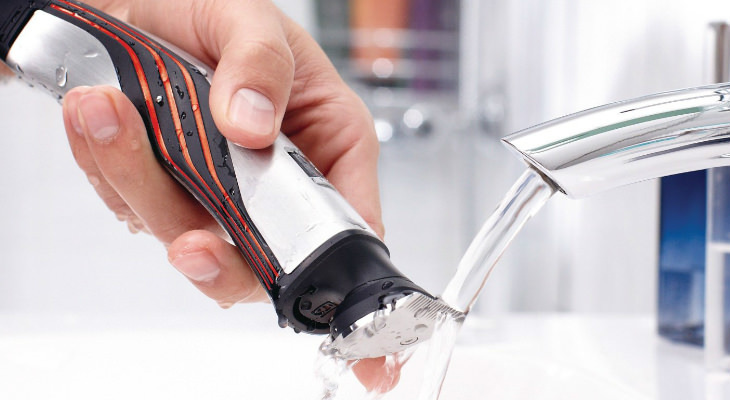 Besides being cordless, this shaver is also fully washable and water resistant. While you won’t want to immerse it in water, it’s safe enough to use under a running tap of water, and with shaving gels, lotions, foams, or creams. There is a cleaning brush included, so you can ensure that you get out all the minute hairs and shaving products before putting away for another day. The Philips Norelco All-in-One Styler & Shaver is virtually maintenance-free, so you won’t have to worry about purchasing any shaving oils to keep the mechanics lubricated. 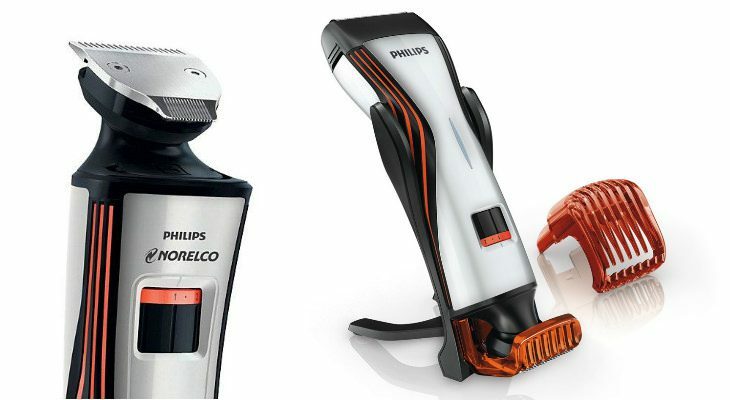 You may have the choice between the Philips Norelco All-in-One Styler and Shaver, or the Philips Norelco Style Shaver Pro. There are only a couple of differences, so it should be simple to help you choose between the two products. The Pro only takes one hour to charge it up to 75 minutes of shaving time, while the Philips Norelco All-in-One Styler & Shaver takes a four hour charge. The Pro also has a detailer comb and a travel pouch. The Pro also costs double the price so you’ll have to decide for yourself if these few extra features are worth the additional cost. 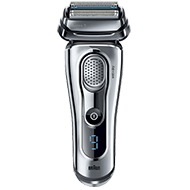 The Philips Norelco All-in-One Styler & Shaver costs around $50, but is made with the excellent quality of the Philips Norelco line. Sure, you can buy cheaper stylers and trimmers, but this one is backed up by a Philips warranty, and should last you for years. There is a two year warranty on this product. 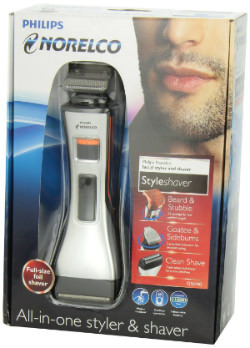 Reviews are favourable for the this Styler & Shaver, with 4.5 out of 5 stars. The Philips Norelco All-in-One Styler & Shaver weighs 15.2 ounces and 1.2 pounds with everything in the box. It measures 1.8” x 1.2” x 9.3 inches. In the box you’ll get one Styler & Shaver, a charging and power cord, a charging stand, a beard comb, a protective lens cap, and a cleaning brush. 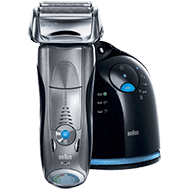 The Philips Norelco All-in-One Styler & Shaver is a great shaver and styler that will tackle all your men’s personal grooming chores.